If you want to party in style, then Platinum Rides has you covered! As the finest party bus and limo rental service in Phoenix, we proudly offer more than just a fancy ride for your event; we offer an unforgettable evening of class and fun. 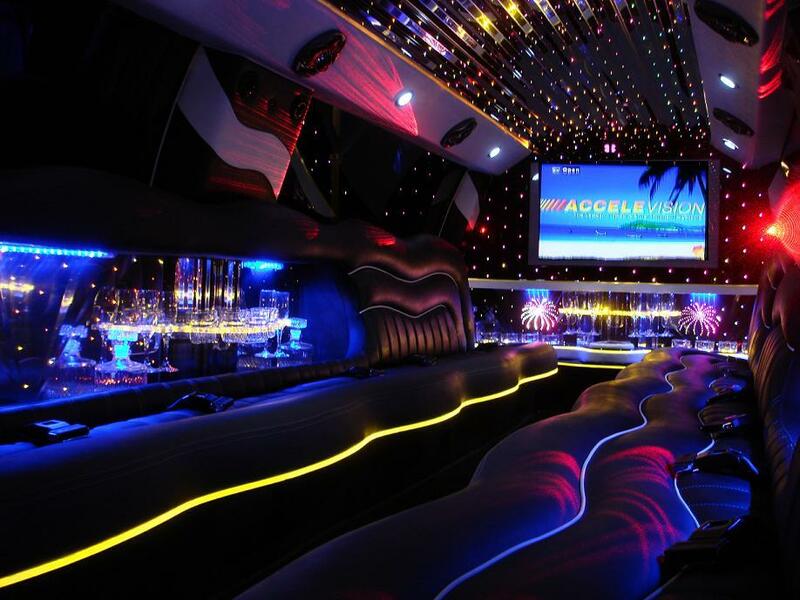 Whether in Phoenix proper or Scottsdale, our party bus service offers stretch Chrysler 300, Lincoln SUV, Escalade, and Hummer limousines for your very own “rock star night.” Our rates are reasonable, our limos are clean and fully equipped, and our chauffeurs are not only professional and safety-conscious, but fun too! We’ve been in this business for 15 years and have built an outstanding reputation as the top party bus and limo rental service in Phoenix and Scottsdale. Our job is making your “rock star night” a fun and unforgettable experience. Our party buses and limos are fully equipped with big screen TVs in the front and back and an upgraded dual-sub sound system. Hook the sound system up to your Bluetooth, put in your favorite CD, plug in an AUX cord, or just blast the radio and enjoy crystal clear sound! Custom seats and LED lighting ensure that the party never stops. While food isn’t allowed on your Phoenix party bus, we do provide large coolers with plenty of room to store any kind of beverage you would like to bring. Bring your own ice and glasses or use ours to enjoy whatever drinks you choose to bring onto the bus with you. For 15 years, Frank and Joey have run Platinum Rides as a family business and it’s our personal mission to make your night on the town safe, fun and memorable. We strive to provide quality, luxury party bus and limo rentals to the Phoenix and Scottsdale area, ensuring that no matter the occasion, we have the perfect limo or party bus to suit your needs. For a true rock star experience, look no further than Platinum Rides! If you have an upcoming party or other event, make it one to remember with Platinum Rides premium party bus and limousine rental services in Phoenix and Scottsdale. Call us at (602) 230-7433 or toll-free at 1-800-514-8812 or contact us online to request a FREE quote! We look forward to serving you!